I have been so fortunate to have found some wonderful challenges to keep me healthy and fit over this winter and the holidays, and I have found a new challenge to start off 2013!! They have set up a 13 In 2013 Facebook group to support and encourage each other and share the experience. To support everyone reaching their goal Jen and Jill will host 4 virtual races throughout the year. The first virtual race will be in February. More information coming soon. You might be wondering what distance we will be challenged to run? Unlike 2012, when everyone was running the same distance, in 2013 you pick and commit to one of the following: 5K, 10K, half marathon, marathon, trails, or races that vary in length. Sign up [and commit] using the Google document. Sign ups close midnight (EST) on December 31. Post the button with the distance of your choice on your blog on your sidebar (HTML will be provided if needed). Update the Google document with your progress and completed races. I have signed up for this wonderful challenge and will be doing 13 mixed races in 2013! What I find really great about this challenge is the introduction of virtual races! Virtual races are races that you sign up for on the internet, and then you do the race wherever and whenever you want (most do have a set time frame). This is great! I live where there are no races in the winter and the closest races are usually 2 or more hours away. Virtual races are also great for the beginning runner. Some people are afraid to enter a race due to the fear of coming in last. I had this fear during my very first race too. Others don’t enter because they fear other’s will judge them and their performance (I hear this one all the time from people and I wish they would realize that everyone will be cheering them on). A virtual race will give those beginners with fears a chance to do a 5K or even a Marathon without having to worry about times or other people. 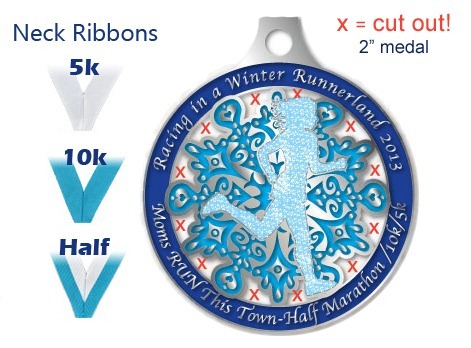 I have already signed up for a few virtual races myself, and you get a medal for them too! 5k / 10k / Half Marathon. It will run from January 1-31st. With this race you even get a medal!! I have signed up for the 5K! 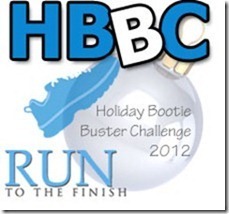 New Years Resolution Run is a 5k and/or half marathon that runs from Dec 30th to January 1st, 2013. This is a great way to start off your new year! What could be better than a race to start out the year in a healthy fashion!?! I know I’ll be doing their 5K!! Plus all the proceeds go to For the Love of the Kids. 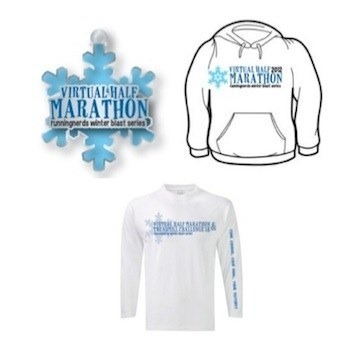 Virtual Half Marathon & Treadmill Challenge 5K Winter Blast is another virtual race with great swag and a medal. I runs from Dec 22-January 1, 2013. Just check out the picture above and see the cool swag you get! Muffins to Marathons also has some great virtual races coming up in 2013! With their races you get a t-shirt and a medal!! There are also big cash prizes! I know I will be doing some of these races. See below for dates and t-shirt images. Images Below are what the t-shirts will look like. On to a recap of my week in the workout department for the other challenges I’m part of. The Holiday Bootie Buster Challenge has been absolutely wonderful in the motivation department. By earning points for exercising and eating healthy I have gotten on a great health kick. My family and I are now eating our daily servings of fruits and veggies. I have gotten to the point that I get all my servings without thinking about it! For example, right now I’m munching on fruit while I’m typing instead of drinking a latte or cup of coffee. I have also been working out and teaching a bunch this week, so I was really able to rack up the points. I also have to credit HBBC for getting me to enjoy my yoga time. I have had to do longer yoga sessions each day due to the extra cardio and weights I have been doing. Thanks HBBC!!! Here is a break down of my points from this last week. Week 2 Goal: Eat 5-7 servings of fruits/veggies!! One great way I got a big chunk of veggies was from soup. My Roasted Butternut Squash and Carrot Soup was a healthy addition to my meals. 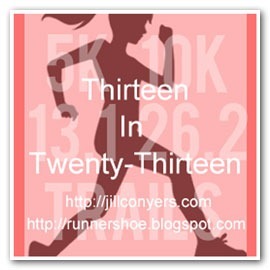 This entry was posted in Fitness Challenge, Running and tagged best body bootcamp, Holiday Bootie Buster Challenge 2012, thirteen in twenty-thirteen, virtual races, workout challenges on December 1, 2012 by fromfltond. I signed up for the Thirteen in Twenty Thirteen too! I think it is a great challenge to get motivation up ALL year 🙂 Also love the virtual races, I need a race buddy! My boyfriend works 2 weekends out of the month and he is my racing partner and slowly falling off the wagon! Thanks for an awesome post! You are so right about the ALL year part! I know I’ll be doing my virtual races during the week due to my husband’s work schedule, so I know how that goes. Here is to 2013!! Thanks for sharing all of those virtual races! I run a lot of actual races but I really enjoy doing as many virtual races as I can too. It looks like you had another great week with HBBC! I had no idea that virtual races even existed until Jill and Amanda wrote about them. I’m so excited to do one in January! Thanks for the shout out for 13 in 2013! I’m hoping to have at least 100 participants and your post will help! Great job with week 2 of HBBC! Wow, those sound like some great virtual races! And you even get a medal? I will have to check some of those out! Yup! They have awesome medals!! I love this list of virtual races, I’ve never done one before but I am definitely going to look in to some of these! Also looking in to the Best Body Bootcamp for January! I’ve never done a virtual race either, and I’m so excited to do one next month! 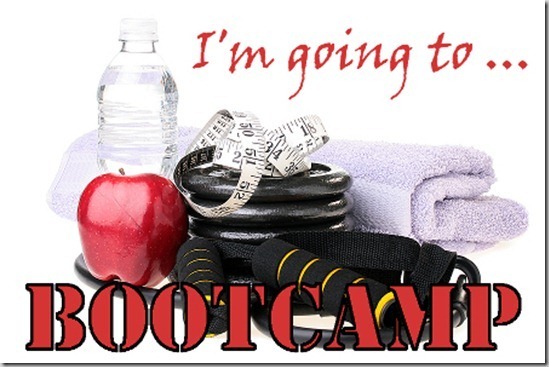 You will love the Bootcamp. Tina comes up with great workouts! I’m sorry but what button am I suppose to post? I don’t have a blog. Thanks. If you don’t have a blog don’t worry about a button. 🙂 The buttons are just for those with a blog who wish to share what they are doing with 13 in 13.